I have more indepth pictures and some swatches of the NARS Holiday 2010 Collection that I shall post up tomorrow, but here’s a quick sneak peek at the collection as a whole. Have I got your attention? Come back tomorrow for more! If the lipstick on the right swatches the same as it looks, it shall be mine! that purple duo! must. get! but I’m loving the look of 4 products here! omg, i already want the eyeshadow, varnishes, and blush! can’t wait to see more! Hm, I guess I’ll need to see the swatches, becuase these photos don’t look as impressive to me. 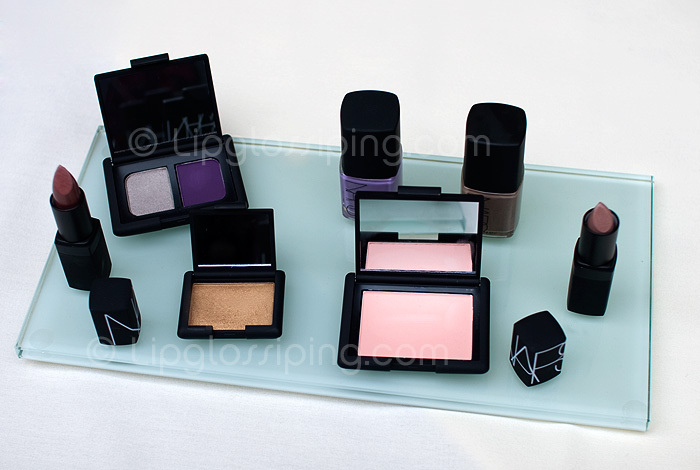 Btw, do you know if there will be any limited edition NARS sets/palettes for the holiday 2010? Thanks! Love all those purples, love it!